This post is in addition to an earlier post about moving the OpsMgr-database to another SQL-server. It seems that there is one more thing which needs to be done. I was a bit suprised at first but since I had created many dynamically populated groups already without any error I knew the error had to be related with the move of the OpsMgr-database. More over since that was the only change in the SCOM-environment. How nice! This event told me what was wrong: The execution of usercode in the .NET Framework is disabled. And that is default on a freshly installed SQL 2005 server. When one installs OpsMgr this feature is enabled. But in this case that is a different SQL-server now. By default SQL accepts only Stored Procedures based on T-SQL. But when one creates a group which is to e bdynamically populated, certain Stored Procedures are used which are based on any language but T-SQL. On many occasions customers ask me about notifications in general and SMS-notifications particularly and how to make a SMS-enabled device work in conjunction with the RMS. Actually it is very straightforward. Windows Server has to detect the SMS-enabled device (a mobile telephone) - for instance - as a modem. That is all there is to it. When this happens, SCOM will be able to send SMS messages. Nothing more, nothing less. Where do you find a good driver (x86 / x64, W2K03 and W2K08)? I myself do have good experiences with a universal cable driver of Nokia. No, I do not want to start advertising Nokia but this cable driver really works very good with many types of Nokia's. A networkengineer of a customer of mine pointed me to this driversoftware and from that moment on, it has become a regular tool in my personal SCOM toolbox. It can be found here. Also drivers for other brands can be found there. Just a plain one. No fancy stuff on it like a dual screen or clamshell (breaks easily when attaching it to the RMS with Velcro). But just a simple straightforward type of Mobile telephone will do the work. Hey, we do want to send SMS not to play all kind of fancy games or to impress our colleagues with a bling bling mobile do we? And the simpler the telephone is, the better it will work. Not all too many bugs in it. This really happened. I got it out of the field. Attaching a prepaid mobile to the RMS, forgetting to check its balance so it run out of its credits and not a single SMS message got out. Before this was found out, it took the people involved many frustrating hours. So do not use a prepaid mobile it is bound to go wrong. On many occasions customers ask me about notifications. For instance, why - when using sms - they must attach a SMS-enabled device (like a mobile telephone) to the RMS and not just any other Management Server. Since this question pops up quite often I have decided to write a posting about it, eventhough there are many good (technical) postings already about it. So I will stay away from the technical details and try to give a more down to earth explanation (more for IT managers..) instead of a deep dive in the techniques behind it. For the techies who want to know 'just' that, go here. It is a good startingpoint for a technical deep dive into the world of notifications. One of these special services is the SDK Service. This service plays an important role, also in handling notifications. Whenever an Alert is raised, it is showed in the console. When a SCOM administrator makes a subscription he/she doesn't do anything more then creating a filter which 'tells' SCOM when certain Alerts have to be put into a message and send off to SMS, E-mail or IM. This very same subscription checks the SDK service to see whether any new raised alerts matches the applied filters. When it does, the Alert is send off to SMS, E-mail or IM (as specified in the subscription). This also explains why a SMS-enabled device must be attached to a RMS, since the RMS is the only Management Server in a Management Group with the SDK Service in a running state. Thanks to input from the community I have rectified this posting. It seems that the recommended practice by Microsoft is not to delete lines from the DB but to use the stored procedure for it. Kevin Holman has a posting about it which can be found here. It covers in detail what steps have to be taken. It is good to get input like this from the community since I can't possibly know everything and therefore I am prone to error. So please send feedback and keep me sharp. One or more computers you are trying to manage are already in the process of being managed. Please resolve these issues via the Pending Management view in Administration, prior to attempting to manage them again. It seemed that the server was an Agentless managed system before. So the system was already present in the OpsMgr database. Before the Agent was installed on the very same server, they had forgotten to remove it from the Agentless Managed systems. When the installation of the SCOM Agent failed (manually or pushed) they removed the system from the Agentless Managed systems. But from that point on it was already 'too late': the OpsMgr database did have entries about this particular server which didn’t match with the real situation. Please use the Reporting Services Configuration tool which is installed with SQL Server to validate your SQL Reporting Services configuration. The account of the Web Service Identity of SRS doesn't match with the account being used in SCOM. Of course running the Reporting Services Configuration tool is the first step in the process of making it all work. Run it from the commandprompt with this syntax: ResetSRS.exe MSSQLSERVER. When this is done start the Reporting Services Configuration tool again, go to the option WebService Identity and click the Apply button. This way SRS has been brought back to the state as it was before the SCOM Reporting installation was ran. Sometimes one bumps into a situation where one has to move the SCOM database to another SQL-server. On itself it is not a big issue. When one follows these guidelines, there is nothing amiss. Matt Goedtel has posted an article about it how to solve it. One must run a sql-script on the new SQL-server and all is well again. is a question that comes to mind when designing SCOM environments. On the internet many topics can be found on this subject but - as far as I am concerned - the articles posted on System Center Forum are the best since they cover this topic in great detail and are objective as well. These people have gone to great lengths in order to get answers by building themselves a lab based on VMware and Hyper-V.
A must-read for everyone designing SCOM environments. Look here for the lab they built and here for part 1. More topics will arrive: one about storage and another is a discussion about Virtualization Architecture. An exception occured processing a group membership rule. The rule will be unloaded. Exception: System.ArgumentOutOfRangeException: Index was out of range. Must be non-negative and less than the size of the collection. This result will have a column named MPFriendlyName. This will show the MP containing the faulty collectionrule. The column DiscoveryName shows the culprit. In the Console go to Authoring, Management Pack Objects, Monitors. Go to 'Change Scope'. 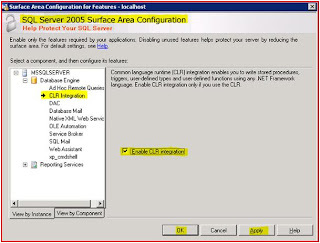 In the 'Look For' box type 'Windows Server 2003 Computer'. 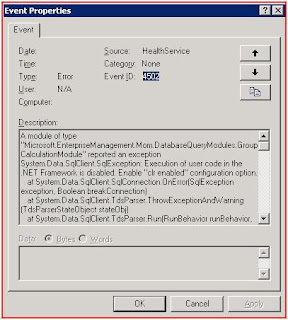 Only select this target, click OK.
Collapse 'windows server 2003 computer', 'Entity Health', right click 'Security', select 'Create a monitor', 'Unit Monitor'. Select 'Generate alerts for this monitor'. Set Priority to 'High'. Set as Alert Description '$Data/Context/EventDescription$' (the eventdescription of the eventid will be displayed in the Alert), Create. Create two more monitors, each following these steps but instead of 'Domain Admins' for the EventDescription, one uses 'Enterprise Admins' for the second monitor and 'Schema Admins' for the third monitor. Be sure to put these monitors into the same Management Pack. By using overrides these monitors have to be enabled for the Domain Controllers. Do this by selecting 'Overrides', 'Override the Monitor', 'For a Group…’ and select the group ‘AD Domain Controller Group (Windows 200x Server)’, (when the AD MP is loaded). Otherwise create group containing the DCs (store this group into the same MP as these monitors) and use that Group as the override target. This article is based upon a blog posting of Kevin Holman. Look here for this blog posting. When one wants to monitor whether a user is added to the AD global groups 'Domain Admins', 'Enterprise Admins' & 'Schema Admins' it can be a challenge to make this monitor work. However, when one follows the steps in this blogpost of mine, the monitor will run like clockwork. Mostly I prefer to use monitors since they are nicely displayed within the HealthExplorer of the monitored object so it easy to see whether the monitor is being used. Of course, there are multiple ways to make these monitors even better. One can add monitors to watch whether members are removed from these Global Gorups (EventID 633), or one can change the description of the Alerts, only displaying the name of the Global Group and the name of the user being added/removed. This can be done by using the correct parameter. For this a logfile parser is needed in order to findout the correct parameter numbers. But above steps are a way to make things work and later on one can adjust everything as needed. This article is based upon a blogposting of Kevin Holman. Look here for this blogpost. This entry points to where the Agent is installed and where the State Directory is to be found. This directory is the repository for the SCOM Agent. When this entry is missing, import it from a system where a working Agent is installed. This entry is needed by the Agent service to run. When it is not there import it from a a system where a working Agent is installed. The Agent should work now. 26-08-2009 Update: PFE Jimmy Harper also ran into this issue and solved it in a different manner. He also blogged about it, found here.